While just a region of a wider world, the aberrant nature of Davokar makes Ambria all the more dangerous place to live. The coiling, clutching labyrinth of the forests depths turns even short journeys into intolerable nightmares. The Ambrians have sought to find alternative means to travel the great woodlands, key amongst those the river journeys made to the free colonies in the Bright reaches. However, as the Ambrians push ever north, with the encouraging words of the Queen echoing in their ears, it becomes clear Davokar brooks no easy ingress. The Ordo Septimus have a special place in the greater organisation of the Ordo Magica. For those who have sworn to the Seventh, the cloistered life of their colleagues must seem stuffy and ill-conceived. The world brims with magic, yet most wizards would rather ruminate on the retrieved rubble and detritus of ages past gathered and returned by treasure-seekers at considerable expense. The chapter of the Ordo Septimus has sworn a path of both physical and esoteric danger, driving out into the verdant Unknown. The Progredior – practitioners of magic that specialise in the arts of long distance communication – embrace the potential offered in the firsthand experience of the outdoors. They hold as much fear and trepidation as others in visiting the verdant depths of Davokar, but they realise the nearly limitless potential. To rely on treasure-seekers and sellswords to uncover the ruins of ages past is to trust in the untrustable. For that very reason, Queen Korinthia sanction experimentation in magic far more powerful, and potentially dangerous, than anything attempted. The chapters of the Ordo pooled their lore and resources to find a means to extend the range and potency of the Magic Circle ritual. At that time, as now, each Chapter maintains only a single Magic Circle for the purpose of communication. The Ordo Septimus, formed in this moment of sanctioned and enforced participation, have more. 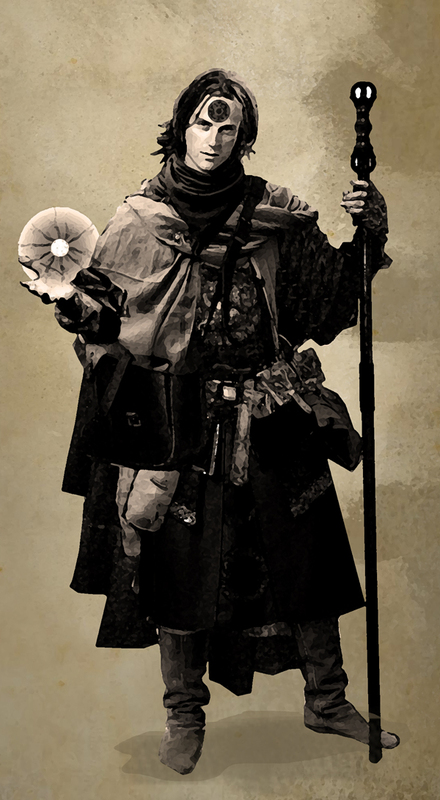 An expeditionary division of the Ordo charged with testing the limits of the principles associated with long-range magic, they draw their membership from more diverse backgrounds than other chapters. The current head of the Chapter, Edin Ovallo, has good relations with Colonel Kalfas, of the Queen’s Rangers, and holds periodic recruitment drives from the corps ranks. For Kalfas’s part, siphoning rangers off into Ordo Septimus saves them the indignity of attention from the overzealous Black Cloaks, as these individuals always show the ‘touch’. The Ranger recruit their number for their natural talents in the midst of natural surrounds and sometimes that intuition comes from hints of what the Twilight Friars would call inherent corruption. Those members of the Chapter who do not come from the Rangers or a similar background spend time in active service and study with the soldiers in the field. Those inducted always show a keen potential, independence of spirit and respect for the unfettered wilds, but invariably need study in either the lore or practice of surviving. The Chapter takes survival very seriously indeed. Practitioners of the Ordo Septimus manage their expeditions with the greatest care and attention to detail, planning for lengthy periods in advance to make the best of good weather, natural resources, and intelligence around the movement of barbarians and elves in the areas visited. They have a twofold purpose in their ventures – identifying secure locations and setting the groundwork for the rituals necessary for founding a Circle. Under the best of conditions, the Ordo Magica take the installation of any Magic Circle very seriously. A Magic Circle resembles, in many ways, modern forms of communication that allow an individual to access information remotely, accessible to all senses with the right setup, but which someone with the right know-how might subvert to misbegotten ends. On a temporary basis, a practitioner can create one with just a bag of sand and a period of feverish muttering, but the Ordo Septimus take the matter more seriously. A Progredior does not enter the field lightly nor do they hope to establish some temporary beachhead for short term benefit alone. Some of the first Magic Circles established by the Ordo Septimus in the depths of Davokar have remained accessible, usable and hidden for more than ten years. The key concern of any member of a Septimus ‘away team’ should be finding a viable and safe location to establish a permanent Magic Circle with a minimum of disturbance, interference or danger. After finding any site with potential the Progredior will often establish a ‘hide’ to allow observation and assessment while minimising possible discovery or undesirable predation by local wildlife. This assessment could take days or even week during which time the team will have to make the best of the situation and ration their supplies. With a ritual like False Terrain in place, prerequisites of the great Magic Circle ritual can begin. To be clear, this ritual does not vary significantly in execution but does in terms of the quantity and quality of material used. A robust Magic Circle will use elaborately engraved tiles of polished stone, exquisite filigree of precious metals, and certain rites and formula of sanctification that only the Chapter and the masters of the Ordo Magica know exist. Once secured, sanctified and set-up, a Magic Circle of this type will experience moderated, but frequent, traffic and retain watchful guardianship, even if only through a remote attendant. The Circles remain vulnerable and few and many teams sent to establish them have been lost. One or two of the Circles the Ordo has established allow the progress of whole vessels – including the Queen’s great thorn ships. Original photo bash image by Jonny Gray. Used with permission. Unlike so many members of the Ordo Magica, you embrace the mysteries of the wider world head on and do not hide behind the witless swords of treasure-blinded adventurers. You walk the wilds and catalog the depths in the darkest parts of the great forest and beyond. You have experienced the strange disconnect of transition through magical gates so many times you can’t promise it hasn’t affected you. On the other hand, if you had any fear of death, of the possibility that the preachers and the theurg might be wrong, it has long gone. You have known both the ominous silence of the deep forest and the oblivion of transition… Nothing scares you anymore. In truth, Adept level in Ritualist should be sought as soon as practical and no member of the Ordo Septimus would go far without this level of knowledge. That they focus on such lengthy acts of magic makes them vulnerable and they also tend to develop Natural Warrior and Acrobatics to allow them to handle or avoid brief confrontations without necessarily messing with weapons. Where choosing rituals themselves, Progrediors favor a few, but Magic Circle and Seven-League Stride must obviously figure amongst the first. Others of value include False Terrain, Levitate, Nature’s Lullaby, Sanctum, Tale of Ashes, Teleprinting (see Player’s Handbook, p90) and Traceless (see Player’s Handbook, p94). Original artist of article feature image unknown. No right of ownership intended. Use for non-commercial purposes. If you own this image, drop me a note and I’ll be happy to remove or provide appropriate credit. Is there anywhere an official limit defined for the distance covered in a 7-league stride ? No. The Seven League Stride ritual only requires the mystic have familiarity with the target Magic Circle. It would also require the target Circle remain intact – a major issue for the Ordo Septimus Expeditionary Team in distant lands.